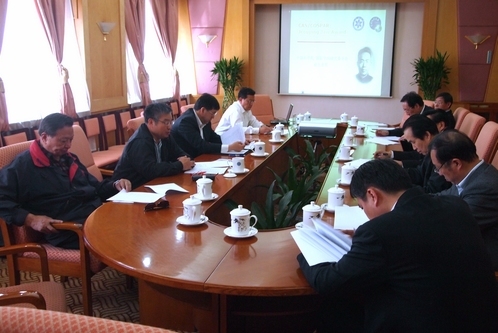 On April 12, 2012, the Third Review Meeting to vote for the winner of CAS/COSPAR Jeoujang Jaw Award was held in CAS headquarters. YIN Hejun, the vice president of Chinese Academy of Sciences chaired the review meeting and the attendees are mainly CAS academicians: OUYANG Ziyuan, HU Wenrui, JIANG Jingshan, GU Yidong, WU Yirong, GUO Huadong, etc. In March, 2012, the COSPAR Executive Bureau recommended 2 potential candidates after a review meeting: Robert Lin, Director of Space Sciences Lab, UC Berkeley and Martin Sweeting, Director of Surrey Space Center, University of Surrey. The aim of this meeting is to finalize the nominee for the third CAS/COSPAR Jeoujang Jaw Award, who will receive the award on the opening ceremony of the 39th COSPAR Scientific Assembly in Mysore, India. 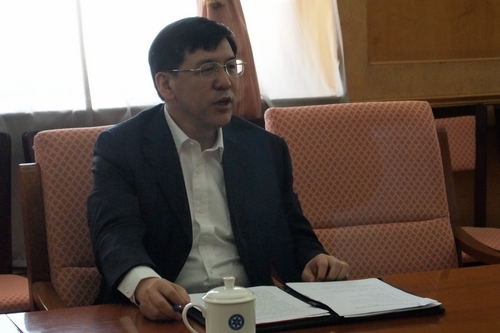 WU Ji, Secretary General of Chinese National Committee for COSPAR, made introduction of CAS/COSPAR Jeoujang Jaw Award, its nominee selection standards and its background. Brief presentation about Martin Sweeting and Robert Lin were delivered by Prof. SUN Huixian and Prof. LI Lei respectively. The attendees of the meeting voiced their opinion from different perspectives and cast their votes. CAS/COSPAR Jeoujang Jaw Award was jointly set up by Chinese Academy of Sciences and COSPAR, which became the eighth COSPAR award in 2006. The award is granted to the people who have made distinguished pioneering contributions to promoting space research, establishing new space science research branches and founding new exploration programs.